When considering the term subatomic particles, many people typically think of things like electrons, protons, or neutrons. We have some experience with these particles because we were taught about them in school. Indeed, we are made of them—electrons, protons, and neutrons comprise atoms, and atoms comprise our bodies. In earlier articles within this series, we have seen that electrons are part of a class of particle called leptons, which are elementary and tend to have very low mass. Protons and neutrons belong to a group of particles called baryons, which are hundreds of times more massive than electrons. To make sense of mesons, we need to explore how the strong nuclear force operates. In the previous article, we saw that protons and neutrons in the nucleus of an atom are each made of three quarks.2 The fractional +2/3 charge of the up quark and the -1/3 charge of the down quark causes the proton and neutron to have a total charge of +1 and 0, respectively. The strong nuclear force is able to overcome the mutual repulsion of protons, but the strong force is also what holds the quarks together within a given proton or neutron. The strong force is similar in some ways to the electric force, but it also has some differences. Without these differences, matter could not exist and biological life would be impossible. First, as implied by the name, the strong force is much more powerful than the electric force at subatomic distances. If this were not the case, then the positively charged protons would repel each other and atoms could not exist. Furthermore, the two positively charged up quarks within a proton would repel each other and the proton would break apart. The strong force makes baryons possible. Second, the strong force has an extremely limited range. This is a phenomenally important design feature because if the strong force had the same infinite range as the electric force, then the former would overwhelm the latter and all the matter in the universe would collapse into a single nucleus. God gave each force the right strength and range so that matter would be possible in all its wondrous forms. There is no way to predict which quark within a proton has a given color.7 The only requirement is that they must add to a colorless combination. The same is true of neutrons and all other baryons. There seems to be a law of nature that quarks will only combine to form colorless composite particles. This is why baryons must always have exactly three quarks. Only a red-green-blue combination will form a colorless composite particle, as shown on the left side of Figure 1. Likewise, antibaryons are also white because they are made of three antiquarks and always have the combination of antired, antigreen, and antiblue. These also combine to make white. Since baryons are made of three quarks, whereas mesons are made of only two (one quark and one antiquark), we would expect mesons to be lighter (on average) than baryons. This is, in fact, the case. What is surprising, perhaps, is how much lighter. Subatomic particles have a property called spin that is a bit like a rotating planet. But unlike a planet, the spin of a particle only comes in integer or half-integer units (0, 1/2, 1, 3/2, 2, …) and cannot be changed. Previously, we found that quarks and leptons have a spin of 1/2. Their direction of spin can either be spin up (1/2) or spin down (-1/2), but the magnitude is always 1/2. When quarks combine to form a hadron, their spins can either add or subtract depending on whether the spins are aligned or anti-aligned. Particles with half-integer spins are called fermions and obey the Pauli Exclusion Principle, which states that no two identical fermions can exist in the same place with the same quantum values. Quarks, leptons, and baryons are fermions. But since mesons have an even number of quarks, their spins always combine to form an integer. Thus, mesons are either spin 0 (if the two quarks are anti-aligned) or spin 1 (if the two quarks are aligned).11 Integer spin particles are called bosons. Since all mesons are bosons, they are not required to obey the Pauli Exclusion Principle. Basically, this means we can put many mesons into the same location with the same quantum numbers. All mesons are unstable.12 They are created during high-energy collisions and then promptly decay into other particles in a fraction of a second. The longest-lived mesons (the pions and kaons) last only 10 to 50 nanoseconds—a nanosecond is one billionth of a second! The heavier mesons tend to decay into various combinations of pions, which then decay into muons, neutrinos, or photons. 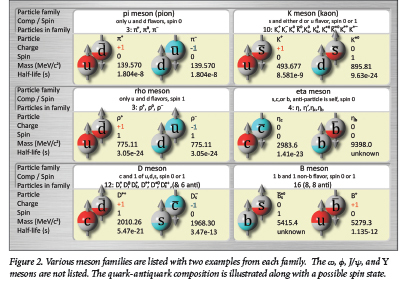 Figure 2 shows a list of some of the more common mesons and their properties. With baryons, there is a clear distinction between particle and antiparticle. Baryons are made of quarks and are common, whereas antibaryons are made of antiquarks and are quite rare. But all mesons are made of one quark and one antiquark; likewise, so is each meson antiparticle. For example, the positive pion (π+) is made of an up quark and down antiquark. Its antiparticle, the negative pion (π-), is made of a down quark and an up antiquark. The two particles are equally abundant, so we could just as well call the negative pion (π-) the particle, and the positive pion (π+) the antiparticle. It is purely a matter of convention. Some neutral mesons are, by definition, their own antiparticle. For example, the phi meson is made of a strange quark and strange antiquark. Swapping quarks with antiquarks and vice versa leaves the particle unchanged. Likewise, the charmed eta meson (µc) is made up of a charmed quark and a charmed antiquark. We encounter a particularly bizarre situation when we study the composition of the neutral pion (π0). It’s the lightest meson, and so we naturally expect it to be made of the lightest quark and antiquark pairs, either the up or down varieties. The total charge is 0. So, it could either be an up quark and up antiquark, or a down quark and down antiquark. But which combination is it? In a sense, it’s both. If we could measure the quark content of the neutral pion, we would find that there is a 50% chance of detecting the up and anti-up combination and a 50% chance of detecting a down and anti-down combination. If we did the same measurement a fraction of a second later on the same particle, we again have a 50-50 chance. The mass difference between the up and down quark varieties is so small that there is nothing to prevent them from converting from one to the other as long as the net charge of the particle is conserved. Similarly, the neutral rho (ρ0), eta (η), eta prime (η’), K (KL, KS), and omega (ω) mesons have indeterminate compositions. We can only assign the probability that a particular quark combination will be observed. Each of these is its own antiparticle since swapping quarks with antiquarks does not change the composition probability. Lisle, J. and V. R. Cupps. 2016. Subatomic Particles, Part 1: Leptons. Acts & Facts. 45 (7): 10-13; Lisle, J. and V. R. Cupps. 2016. Subatomic Particles, Part 2: Baryons. Acts & Facts. 45 (8): 10-13. As with the electric charge, like charges repel (red repels red) and opposite charges attract (red attracts antired). But other combinations are also possible. For example, red will also attract green or blue and repel antigreen and antiblue. Models proposed by some physicists predict that fleeting quark-antiquark pairs are constantly produced and annihilated within baryons. However, even these models agree that there are three “main” quarks called valence quarks. Quark color charges combine in an additive way, just like the literal colors of light. Red combined with green yields yellow—yellow plus blue yields white. This is the opposite of the way paints mix, which is subtractive. In paints, yellow combined with blue yields green, not white. This is a simplified picture because the gluons can contribute to the total color charge as well. But on average, the three quarks will indeed have three different colors. In other words, the down quark might be red while one up quark is green and the other is blue. This is one of six possibilities. A hadron is defined as any particle made of any combination of quarks or antiquarks. Since apparently a composite particle must be colorless, there are two types of hadrons: baryons and mesons. Theoretically, combinations of more than three quarks and antiquarks are possible as long as they add to a colorless combination. Some have been claimed, but none have been experimentally confirmed. The reduction in mass that occurs as isolated particles fall into a bound state is well known and is called mass defect. As one example, a helium nucleus is slightly less massive than the sum of two isolated protons and two isolated neutrons. The more tightly bound a system is, the greater its mass defect will be. One exception is the upsilon meson, which uses the capital Greek letter Υ. This naming scheme is for ground-state mesons. Mesons can also have a spin of 2 or higher if one or both of the quark and antiquark pairs exist in an excited state such that their orbital momentum contributes to the total spin. This can only occur in integer steps, so the meson continues to be a boson. Protons and electrons cannot decay because they are the lightest baryon and charged lepton, respectively. Such a decay would violate conservation of baryon number or violate lepton number. But there is no such conservation principle for mesons. A particularly striking example of this concerns the neutral K-meson (kaon). This is the only particle known to violate a physics principle called CP symmetry. We won’t go into details, but suffice it to say that physicists would never have known that CP symmetry is not absolute if it were not for the neutral kaon. Cite this article: Various Authors. 2016. Subatomic Particles, Part 3: Mesons. Acts & Facts. 45 (9).